The understanding of Yoga has acceptance that as there are different human bodies, so is different human nature. A single approach is not suitable for everyone. As there are different temperament or approaches to life, so are there different paths of Yoga. These paths of yoga are basically main schools which are different from each other with way they approach the concept of practice of yoga. There are many paths of yoga, but certain have gained more prominence and clear understanding. Jana Yoga is path of Self Analysis.This path requires study of the scriptures and rational analysis of self. With time this leads to detachment and deeper understanding. This also makes it one of most difficult path of Yoga. As this self analysis is of the mind by mind, the chances to intellectual dalias and getting into philosophical dialogues is more as compared to other paths of yoga. This is the path of knowledge and wisdom. This involves intense mental discipline. The sadhaka learns to discriminate between the real and the unreal, between finite and the infinite. As stated by Swami Sivananda, without strengthening the mind and having stable devotion, jnana yoga becomes mere idle speculation. This is the path of devotion. This path particularly appeals to those of emotional nature. It is a path of self surrender, of devoting dedicating all resources, in attaining the ultimate reality. We find this bhakti elaborated in Bhagavadgita. All actions are done in the context of remembering the Divine. Through prayer, worship and ritual you surrender yourself to God, channelling and transmuting your emotions into unconditional love or devotion. Chanting or singing the praises of God form a substantial part of Bhakti Yoga. It is Yoga of Action. Selfless action to be precise. Performing action without expectations of fruit of the action is karma yoga. This path is one of two main paths of yoga mentioned and explained in Shrimad Bhagvad Gita. Doing selfless action takes care of ego & pride attached with expecting results of actions. Once you are free from expectations of the fruits of your karma, you are also free from consequences of such karma. This selfless act, purifies your heart & reduces the ego over time. Raja & Hatha Yoga are interchangeable used for same meaning. This path of eight steps (ashtanga). This path is systematic approach to train your mind and body to prepare for spiritual journey. Once the body & mind is trained then your elevate your awareness through meditation. 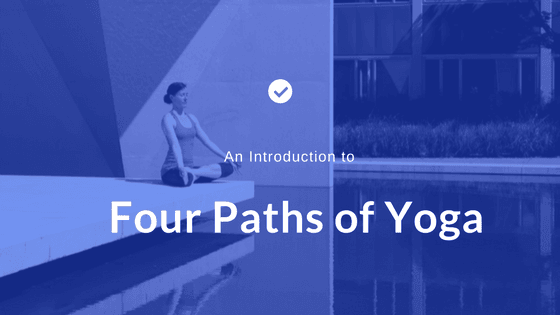 This path teaches ways of controlling the body and mind, including silent meditation. These practices gradually transform the energy of the body and mind into spiritual energy. This path suits people who are looking for inner and outer transformation. Normally, when different paths of yoga are discussed, the enquiry leads to the understanding that the paths of yoga are separate from each other. They are not. Yoga means union. And as a rational understanding, you are made of action, energy, intellect & emotions. When one part is dominant, you are advised to follow certain path. But, on the path of self progress, you are bound to follow certain aspects of other paths too. This leads to proper union of all the faculties of a complete yogi. A Karma Yogi needs to know the devotion aspect also. Reading of classical texts is recommended to all, which is an act of Jnana(Gyana) Yoga. Same understanding is for other paths of Yoga.